The view, along Exchange Street towards Academy Street. The site (between Hector Street and Academy Street (right) currently has a demolition contractor’s advertising sign but no hoardings or any sign of work starting. 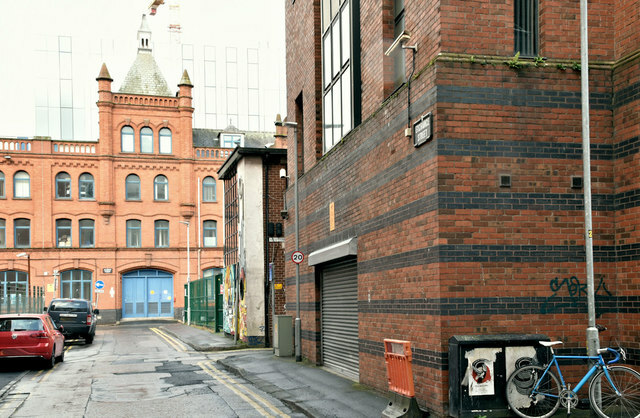 A development site at 81-87 Academy Street and 2-6 Exchange Street, adjoining the Cathedral Quarter, close to the “MAC” site. The original proposal (2004) for an office building did not proceed. The site is the subject of the following application (18 December 2017) for planning permission “LA04/2017/2811/F Demolition of existing building and erection of 19 storey residential building comprising 105 units (42 x one bed and 63 X two bed), ancillary ground floor and mezzanine users including management suite, café, servicing (refuse/recycling/cycle storage/general storage), plant room and substation. 81-87 Academy Street & 2-6 Exchange Street Belfast BT1 2LS”. The photographs submitted by me appear as a matter of neutral record only. I have no connection with the proposed development and express no opinion. I cannot enter into correspondence. This page has been viewed about 22 times.